I found this book upsetting to read, and now I am finding upsetting to write about. Because it deals with some difficult subjects – the consequences of depression; the pain of bereavement and loss; the far-reaching effects of grief can do – that strike very close to home. I carried on reading – and now I am trying to write – because Rebecca Wait set those themes at the heart of a compelling family story, and because her perception is so acute that I find myself deeply moved and very nearly lost for words. 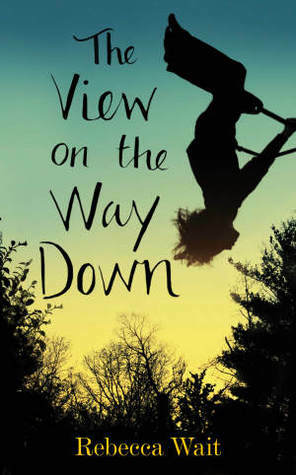 The View on the Way Down is the story of a family. Rose lost her eldest child, and she is trying to cope by making a lovely home for her husband, trying to fool herself into thinking that of only she can do that everything will be alright. But her husband, Joe, is withdrawn, going through the motions at work and retiring to his shed at every opportunity. Because her is angry, with the world, but most of all with his surviving son. Jamie left home, and broke contact with his family, on the day of his brother’s funeral. Now he works in a bookshop, and drifts through life alone. Emma is much younger, and she doesn’t know what happened on the night that Kit died, she doesn’t know why Jamie left home, but she feels their loss and the grief that pervades her home deeply. She has a coping strategy: comfort eating and the Christian Union …. Each character is beautifully realised, and so I was drawn into the story. I cared, and I needed to understand. The story began with Emma, and I couldn’t help but love her. She was lovely, she was sensitive, and when she found herself being bullied at school she felt overwhelmed and so terribly alone. Both of her brothers had abandoned her and she felt that loss terribly; her parents haven’t talked to her about what happened, and she feared that the distress she might cause if she asked questions. And so she tried to manage, to work things out, by herself, but it all became too much. And so she ran. Jamie’s ex-girlfriend saw him at work, she knew the family situation, and she thought it best to let his parents know where he was. That gave Emma somewhere to run. But Jamie was struggling just as much as she was, with the loss of the brother he had looked up to, with everything that had led up to Kit’s death, and with his knowledge of what really happened the night Kit died. At first Jamie was not quite so easy to love, but I felt for him, I really did. And I came to love him too as he raised himself, to look after Emma, and to call is parents to let them know that she was safe. I came to know Kit as well as his siblings, because Jamie began first to think about, and then to write about, the past. His story was so real, so moving, that it very nearly broke my heart. That I felt so deeply for these three siblings, that I was so upset, is a measure of what Rebecca Wait has achieved in her debut novel. I never doubted that she really knew, that she really understood, and that her accounts of depression, of bereavement, of grief, were utterly, utterly credible. And the simplicity and the clarity of her story and her writing allowed that understanding to shine. The children were in the foreground of the story and their parent in the background, but their emotions and experiences were just as real and just as moving. Some things I know through my own life experiences, some things I know because others have told me, and so many moments struck a chord, touched my heart, made me stop and catch my breath. And though it is upsetting, it is also a great joy to find a book that captures those life experiences so very, very well. I am sure it is a book that will resonate with those who have lived through any of those experiences, and a book that will bring greater understanding to those who have not. Jane, your review is so moving – a wonderful tribute to this book, which sounds amazing, esepcially for a first book.